VANCOUVER - Travis Lulay's first start in nearly 10 months didn't get off to an encouraging start. The veteran quarterback and his B.C. Lions waited until the third quarter to trigger the offence, scoring 20 unanswered points in the second half for a 20-17 come-from behind victory over the Winnipeg Blue Bombers on Saturday. Winnipeg was up 17-0 at the break and looked to have the win within reach, but timely turnovers by the Bombers and a strong drive from the returning Lulay late in the game set up Ty Long's 16-yard field goal as time expired. Saturday was Lulay's first start of the year after he underwent off-season knee surgery. He got the nod over a struggling Jonathon Jennings against the Bombers and threw for 326 yards, including one touchdown pass and one interception. Long's field goal gave the Lions (2-2) a split in the home-and-home series, and snapped the team's two-game losing skid. 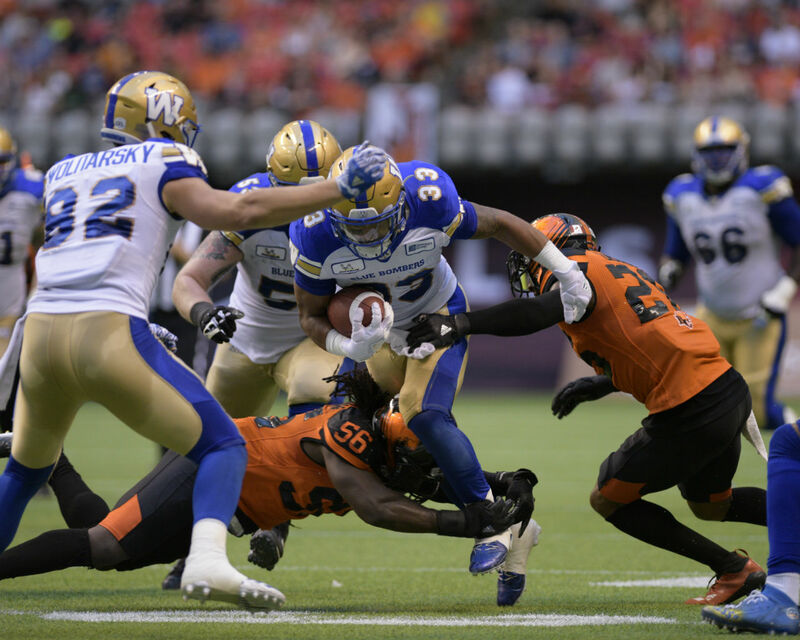 The Bombers, who beat the Lions 41-19 last week in Winnipeg, fell to 2-3 with the loss. Winnipeg kicker Justin Medlock recovered from an early missed field goal with a 50-yarder to extend the Bombers lead to 17. Meanwhile, the Lions were their own worst enemy. Lulay threw to Bryan Burnham in the end zone at the end of the first half, but the receiver couldn't hang on to the ball, preventing B.C. from scoring any points. Long's field goal at the start of the fourth narrowed the deficit to 17-10. The crowd rose to its feet minutes later when B.C. defensive back Anthony Orange intercepted a Nichols pass, giving the Lions a chance to win the game in regulation despite never leading once. The Lions seized the opportunity, with Lulay throwing 38 yards to Burnham, who recovered from his earlier drop and held tight to the football, putting the Lions back in scoring position. The Bombers challenged for offensive pass interference, but the call on the field stood, allowing the Lions to kick the winning field goal with no time left. Lulay credited the Lions defence with forcing turnovers that allowed for key plays in the fourth quarter. "That was huge. That's team football. That's how you win football games,'' he said. It was those costly mistakes that decided the game, said Bombers coach Mike O'Shea. Lions coach Wally Buono was frustrated with the way his team played in the first half, despite the win. "Everything you can imagine we did to give the game away,'' he said, noting that Winnipeg is a skilled team that's going to move the football. Lulay's return was important and the veteran quarterback ran the offence efficiently, Buono added. The Lions could be down a running back following Saturday's win. Jeremiah Johnson went out in the first half with what Buono said appears to be an ankle injury. He said they weren't thinking yet about whether or not Johnson will be back in the line up when the Lions take on the Redblacks in Ottawa on Friday. The Bombers play the Argos in Toronto on Saturday. Winnipeg running back Andrew Harris rushed for more than 100 yards for the 18th time in his CFL career ... The game was quarterback Travis Lulay's 70th career start for the Lions ... An energized crowd of 19,541 took in the game at B.C. Place. Richie Hall defense collapses. I've heard that before. But the Bombers are so amazing though I thought??? Hahaha I love seeing those idiots lose!!! The offence had 5 turnovers, 3 ints and two bad turnovers on downs, and the defence only gave up 20 points, but you blame the defence! How predictable. Do you ever have trouble looking at yourself in the mirror in the morning SWC? You should. Btw, I believe the Bombers have given up the second fewest points per game in the west after Calgary. Terrible game by both Nichols and O'Shea. Those are the Bombers two weak spots and if they start struggling the Bombers are in trouble. They now have a back to back with the Argos, with Franklin finding his groove.